Out Surfing - Back in ten! Yvon Chouinard, founder and CEO of Patagonia, is and has always been an outdoor fan through and through. He feels just a much at home on mountain peaks as on a surfboard. His life philosophy was to become a successful mission statement for his company. This free spirit can still be felt to this day as the driving force behind the brand Patagonia. No other label demonstrates a closer connection between man and nature. 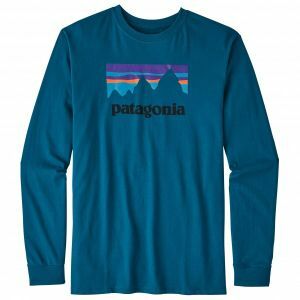 No other brand truly expresses a positive life philosophy to this extent, thus creating an added value that is much appreciated by the countless satisfied customers of Patagonia around the globe. For Patagonia, the use of recycled materials in the production of functional outdoorwear is a no-brainer. Their processes are the result of long-term experimentation and recycling programs. Their biggest satisfaction, however, is the kind of quality produced by the American manufacturer. The garments can be worn for years without showing any noticeably signs of wear, which saves natural resources and a-text--reduces the amount of waste produced. That is why Patagonia continues to work with particularly long-lasting fabrics like Pertex or GORE TEX membranes, which allows them to produce the best possible quality products and premium finish the label is known for. Crazy expeditions, high-performance functionwear, excellent values and plenty of fun - who wouldn't want to represent Patagonia professionally!?! It therefore comes as no surprise that a number of high-caliber athletes represent the American manufacturer around the world. They include legends like Steve House, Lynn Hill, or Tommy Caldwell, but also rising stars like the German Alexander Megos. This is one relationship in which everyone benefits. The information gained from the unique requirements and experiences of athletes flows back to the development and design department of Patagonia. This methodology allows the label to produce functionwear with the best possible pedigree. Mountaineering: Alpine tours, ice climbing, expeditions - the roughest of conditions, fluctuating temperatures and extreme exertion are just some of the aspects of these disciplines. The right kind of clothes won't relieve the physical stress, but will make it a lot easier to endure. From functional underwear to softshell garments and hybrid-solutions or GORE TEX Pro Shell Hardshell jackets - you will find every item you could possibly need right here at Patagonia. Climbing & bouldering Clothing worn in climbing and bouldering should be able to facilitate every movement and be extra-robust and hard-wearing. Patagonia's climbing line includes climbing pants and hoodies, and is designed specifically for the special requirements of the sport. Its cool prints and eye-catching designs make the label particularly desirable. Skiing & snowboarding: Insulation against the cold combined with excellent ventilation and protection against snow and damp - the requirements for skiwear are many. Patagonia is well known for its premium quality insulating down jackets and vests. Their expertise in this type of clothing comes as a huge advantage, offering warmth, freedom of movement, and superior reliability. What could be better than a marriage between excellent design and superior function. 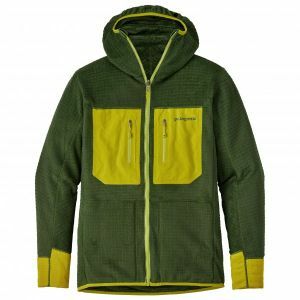 Patagonia garments like T-shirts, pants, shirts, or jackets all come in designs that will make you feel right at home in the mountains as well as later in the pub for some refreshments, or just hanging out with your friends. Patagonia - a unique and unmatched combination of lifestyle and function.